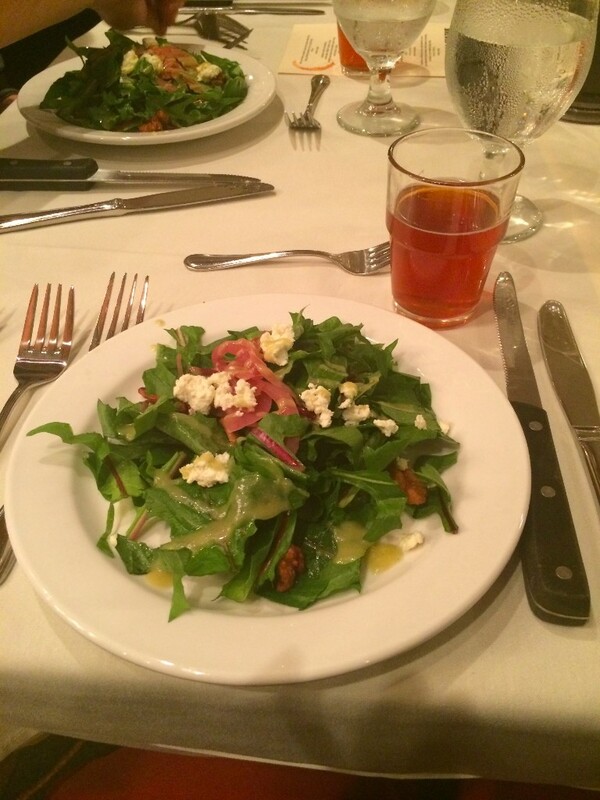 At the Oregon Garden Brewfest 2014, I went to my first Brewer’s Dinner and loved it. This dinner made me want to be a foodie. The food was so good and the beer simply made the entire meal amazing. The only down side was choosing a place to sit. It was like high school all over again. I might have whispered to Tiffany, “This is my nightmare.” Are we cool kids or not? Where do we sit? Clearly, I need to attend more of these events so I can learn a thing or two about seating arrangements. What I did love is that each brewery had their Brewmaster stand up and say a few words about each of their beers. Featuring Golden Valley’s Pinot Noir Barrel-Aged Geistbock. Hazelnut crusted goat cheese fritters garnished with micro greens and a lemon tarragon vinaigrette. This was so light and refreshing for being fried cheese. Featuring Rusty Truck’s (my favorite brewery at the OGBF) Simcoe CDA. 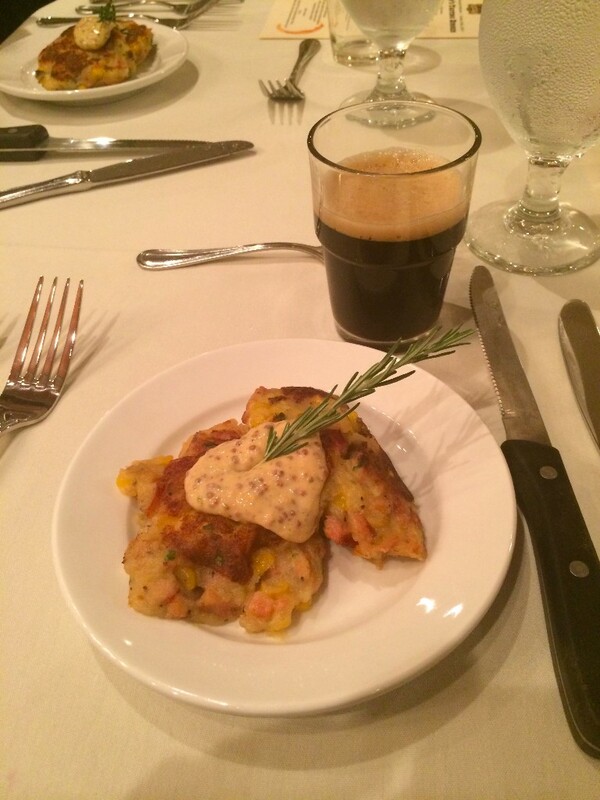 Smoked sausage potato cake topped with garlic and stone ground mustard aioli. This was also delicious snack, like a crab cake and less of a potato latke. Featuring Bridgeport’s Mettle & Mash Ginger Hibiscus Saison. Red baby dandelion leaves tossed with boursin cheese, shaved pickled red onion, candied walnuts and dressed with a ginger / sesame vinaigrette. 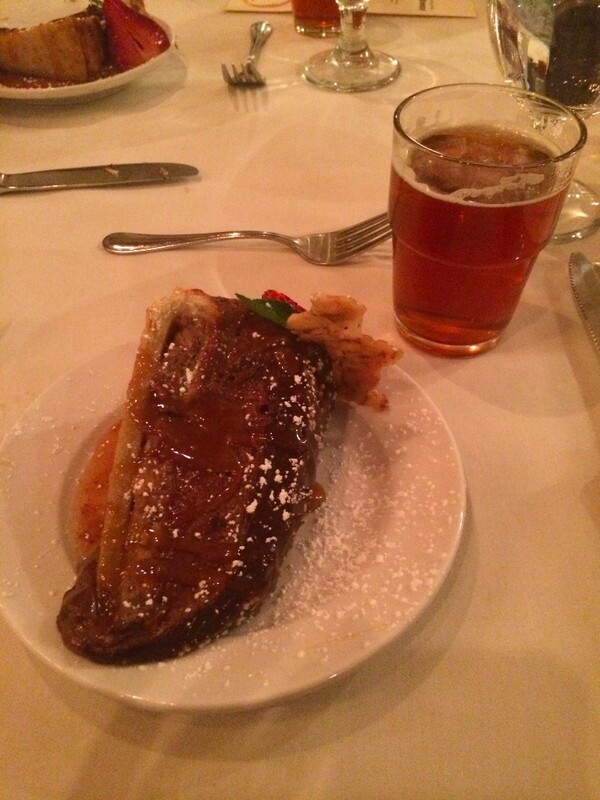 This meal was completely overshadowed by the (tied) best beer at the Brewer’s Dinner. Seriously, mind blowing delicious beer. I love fruit beer and I love ginger. I. Was. In. Heaven! Linguini pasta tossed with sautéed garlic. Featuring Salem Ale Works’ Juniperus IPA. 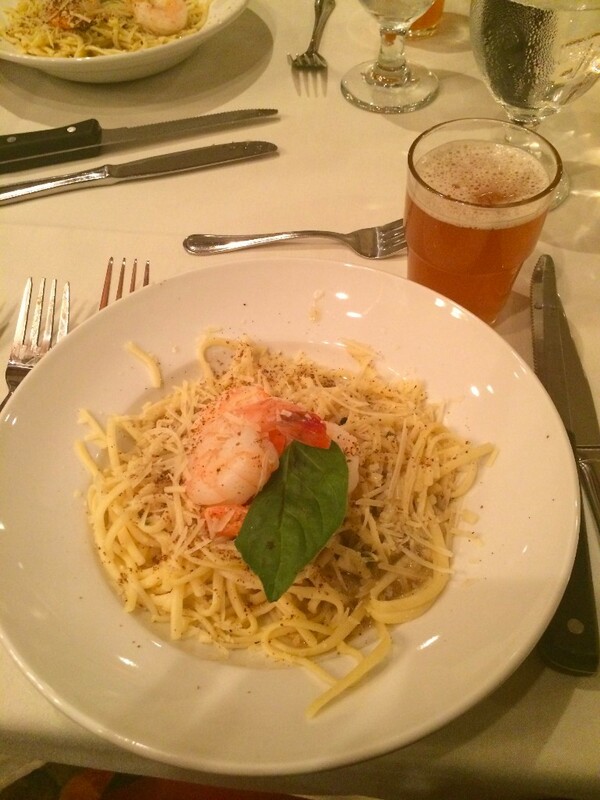 Linguini pasta tossed with sautéed garlic, shrimp, laurel and juniper berries in a white wine butter sauce. To quote Tiffany “All the shrimp for me, because Jenna doesn’t eat them, all the beer for Jenna because I can drink it.” Tiffany is allergic to Juniper / pine (debatable), so I got to drink her beer sample and I’m not a big fan of shrimp so she got to eat all my shrimp. 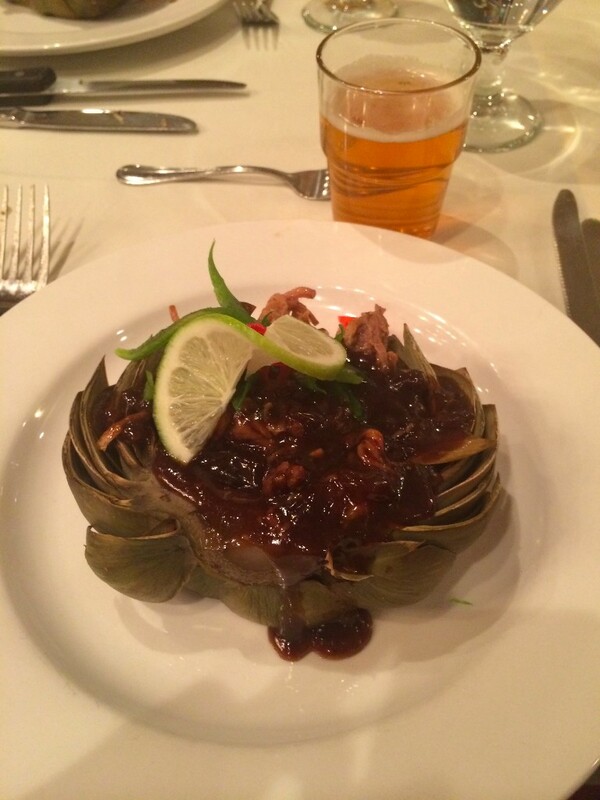 Pork confit inside half an artichoke topped with a honey, ginger, sake sauce. Featuring Cascade’s Honey Ginger Lime. Pork confit inside half an artichoke topped with a honey, ginger, sake sauce. 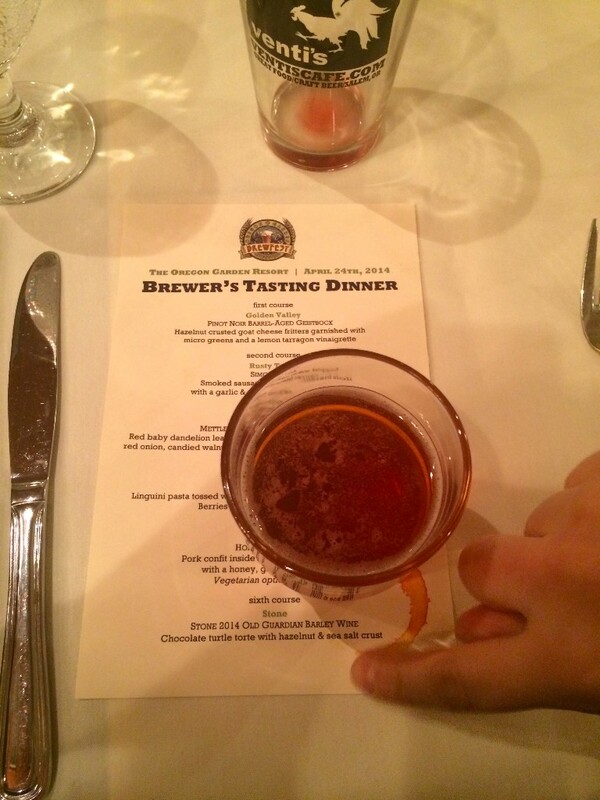 This was the (tied) best beer at the Brewer’s Dinner. Another phenomenal beer. Really sweet, so I’m not sure if this would make a great pint of beer, but it makes a great couple of samples. The sauce was a great dipping sauce for the artichoke. I’ve never dipped artichoke in anything other than butter. It was fun to try something new. Chocolate turtle torte with hazelnut and sea salt crust. Featuring Stone’s Stone 2014 Old Guardian Barely Wine. Chocolate turtle torte with hazelnut and sea salt crust. While I’m not a big fan of barley wine, the torte’s sea salt crust was amazing. I had another glass of Cascade’s Honey Ginger Lime with in and was in heaven. The best way to end a fancy dinner, with a girl’s (other) best friend, chocolate! 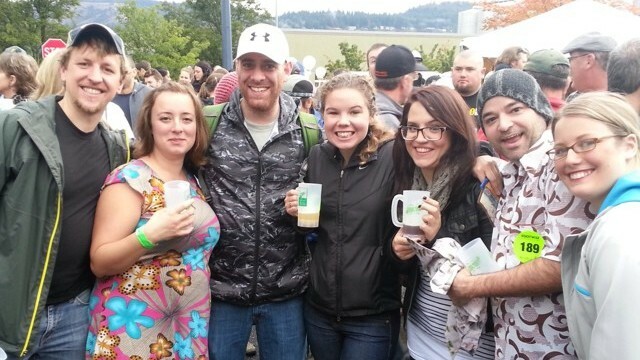 The next day, we attended the 10th Annual Oregon Garden Brewfest 2014 presented by Growl Movement. While I’ve spent plenty of time in Silverton, I’ve never been to the Oregon Garden. It was beautiful! I’m definitely looking forward to going back again. Tiffany and I at the Oregon Garden’s Brewer’s Festival. The Oregon Garden is an 80-acre botanical garden, featuring more than 20 specialty gardens showcasing the diverse botanical beauty that can be found in the Willamette Valley and throughout the Pacific Northwest. The Oregon Garden offers a complimentary narrated tram tour, they’re pet friendly and also committed to sustainability (another thing I love). The Rediscovery Forest is managed in partnership with Oregon Forest Resources Institute and reveals insights on forest management. It hosts one of the largest collections of miniature conifers in the country, in the Conifer Garden, and a 400-year-old Signature Oak, which is an Oregon Heritage Tree, in the Oak Grove. The Wetlands Habitat – cools the City of Silverton’s treated waste water through a series of pools, brims with local wildlife. The Garden also promoted sustainability through green roofs, composting, edible landscaping, and barley straw algae control – the use of barley straw to control algae growth in pond and lakes. 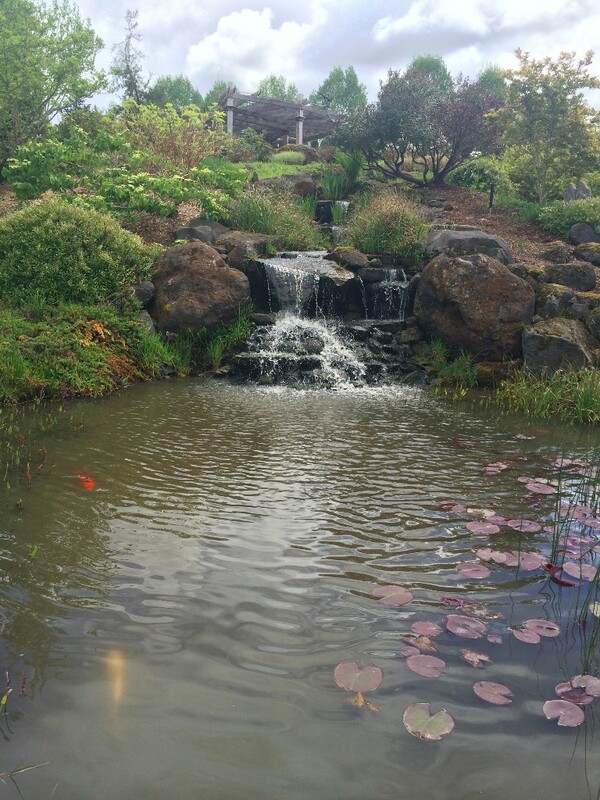 View from the Oregon Gardens. Blacklock Oak Porter by Seven Devils Brewery. This highly drinkable dark ale, has a delicious coffee finish, balanced with a malty front and flight hop character. This porter is easily approachable and dangerously tempting. This was a favorite beer at the Oregon Garden Brew Fest. Located in Coos Bay, I’m excited for the excuse to get to the coast this summer to check out this brewery. Lighthouse Session Ale by Seven Devils Brewery. Light and golden ale with a malty sweetness that is easy to drink. Light in hop character, the malt dominates the profile. Bringing the craft beer movement to the masses, with its easy drinkability. Pale Ale by Ballast Point Brewing and Spirits. Rich golden brew, crafted with aromatic German hops and rounded out with a blend of American and Munich malts. Located in San Diego, this is another brewery I would love the chance to explore. Hot Scotch by Boring Brewing Co. Strong scotch ale with Scotch Bonnect peppers added to give a sweetness upfront followed by a little bit of head from the betters. This beer reminded me a lot of Burnside’s Sweat Heat. Pure Sin by Deluxe Brewing Co. Schwarzbier means “black beer” in German. This is a medium-bodied, malt-accented dark brew with a rich-creamy head. It comes across as a soft and elegant brew, rich, mild and surprisingly balanced. This beer got better and better with each sip. Immortal IPA by Elysian Brewing. A Northwest legend loaded with hop flavor and aroma. Brewed with Pale, Munich, Crystal and Cara-hell malts. Bitten with Chinook, and finishes with Amarillo and Centenial hops. Wild Oregon Logger by Falling Sky Brewing. This brewery gives a 25 cent discount on beers when it rains! This pre-prohibition lager with all Oregon grown ingredients and an extra twist: wild rice from eastern Oregon and Willamette hops for a delicate aroma of flowers and nuttiness. Deep gold in color with gentle malt flavor creates a beer impudent of contemporary American corn/rice lager. Located in Eugene, I’m excited to check out this brewery the next time I’m in town for an Oregon football game. Dreadnut Foreign Export Stout by Falling Sky. This tropical stout was an Oregon Garden Brew Fest favorite. Roasted with 55 pounds of coconut this full bodied with treacle, molasses and a creamy coffee finish. The coffee finish was a great mouthfeel. Fun fact: “Dreadnut” slang for coconut! Manny’s Pale Ale by Georgetown Brewing Company. A careful selection of Northwest hops, premium barley, and an unique yeast gives this ale a rich and complex malty middle with a snappy hop finish. Crisp, clean, and smooth with hints of citrus and fruit. Lucille IPA by Georgetown Brewing Company. Floral, citrusy and a decent beer. Mamba by Gilgamesh Brewing. Boasting 1 IBU, this unique malt beverage, defined by black tea, bergamot, tangerine peel and rye. Miley Citrus India Session Lager by Kells Brew Pub. I’m not going to lie. I’m obessed with Miley Cyrus and twerking. I think it is one of the best things of the 21st century. This beer makes a great summertime beer. Fermented at warm temperatures, is has a bouquet of orange and tangerine but the body of classic lager with Saaz and Hallertauer hops. Premium 2 Row and Vienna for malts. This light dry fruity beer is refreshing with lots of citrus character. Smokin Hell by Oakshire Brewing. A true German lager. It is golden in color, light in body and has a tiny hint of smoke in the nose from 12% Cheerwood smoked malt and 8% Beechwood smoked smoked malt. Baked bread and toasty flavors follow and a faint smoked note lingers to the finish. Cherry Chocoholic by Rusty Truck Brewing – BEER OF THE DAY (BOTD Award). This classic Baltic-style porter is brewed with black hulless barley and three specialty malts, then aged on 90 pounds of hand-pressed Willamette Valley cherries per 10-barrel batch. Flavored with natural chocolate for big chocolate aroma and flavor, balanced by a sweet cherry finish. Dark as night, full-bodied, hopped enough to balance its rich profile. Hootenanny Honey Basil by Salem Ale Works. Very light beer topped with a white head of foam. Lightly hopped, with fresh basil that takes over the aroma yet not the tasted. The honey lends a touch of sweetness. Pirate Stout by Santiam Brewing. This was a perfectly named beer and starts with a sweet Tropical Export Stout and is then aged in rum barrels from the Rogue Distillery. This beer won the People’s Choice Award last year at OGBF! Ovila Saison with Mandarins & Peppercorns by Sierra Nevada. This homage to a monk’s noble work, this blonde farmhouse ale is light in color but has a complex taste. With notes of lemon, peppers, grass and herbs to balance the tang of the abbey grown Mandarin oranges and a kick of white pepper. Gotterdammerung IPA by Stone Brewing Co. Experimenting with German hops, this heft IPA with made entirely with pilsner malts. Red Headed Step Hog by Twisted Snout Brewery. Located in Toledo, Oregon (I had to ask where this is), I found out this brewery is near Alsea, Oregon (where I have family). I’m wicked excited to check out this brewery the next time I’m down at the coast visiting family! NW Passage Stout by Vagabond Brewing. The newest addition to the Silverton family and another great brewery I can’t wait for the excuse to check out. This classic American Stout is upfront with the roasted coffee flavor and ends with a slight chocolate malt taste. Clean with a velvet head. 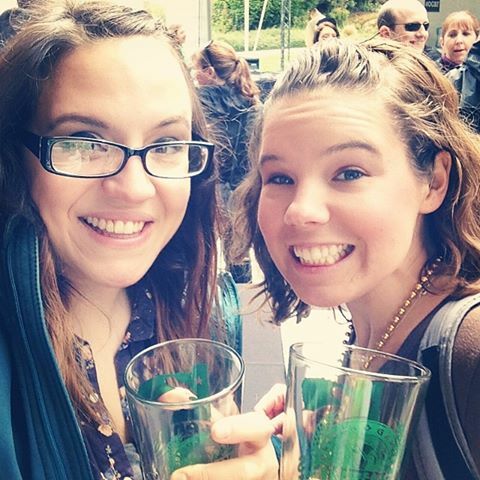 Did you go to the Oregon Garden Brew Fest? What was your favorite beer? For the record, this was a media trip, but seriously, I had a blast! Hi! I’m Jenna. I got the nickname bitesize in high school and I have a beer blog named bitesizebrews.com. I’m lucky enough to live in the microbrewery capital of the world, and home brewing is a hobby I love. With a focus on home brewing, reviewing local breweries and locally crafted beers, I'm excited about sharing my beer experiences with the readers of Eugene Daily News. Previous Story Previous post: If The Oregon Ducks Offered a Two Game Ticket Package, Would You Be Interested?